The Blue Horsehead nebula is a reflection nebula that spans 3 degrees by 1.5 degrees in the constellation of Scorpius. The nebula is illuminated by the star at the horse's "eye" -Nu Scorpii. 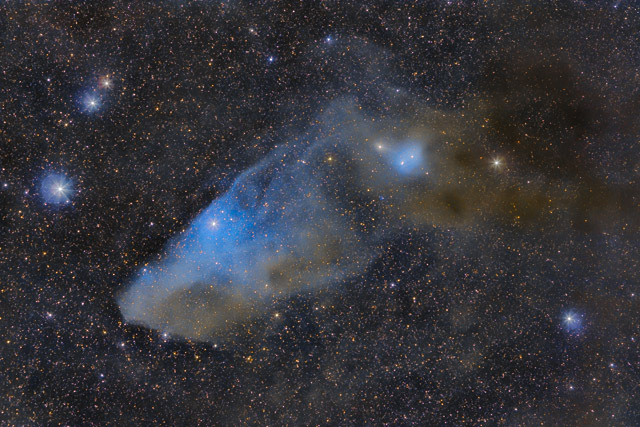 This image also shows a second reflection nebula, IC 4601 at the horses "ear". Despite its colorful beauty, IC 4592 is not commonly photographed. This is probably due to its close proximity to the even more colorful Rho Ophiuchi nebula. As it happens, IC 4592 is part of the Rho Ophiuchi complex. Software Used Images Plus 5.0 for camera control, calibration, stacking, digital development, star shrinking and halo reduction, smoothing and noise reduction. Photoshop CS5 used for levels and curves, high pass filter, star shrinking, screen mask invert, lab color, vibrance, saturation adjustments, selective color, and match color. Gradient Xterminator for gradient removal. Carboni Tools for additional noise reduction, and smoothing. Registar for aligning stacks and for color channel alignment. Notes I enjoyed photographing this often overlooked target, and I was quite pleased with the very nice color I was able to capture. My plan is to eventually use this image as part of a wide field image of the entire Rho Ophiuchi complex. This image was chosen to be Nasa's Astronomy Picture of the Day for April 2, 2013. This is my very first Nasa APOD! This image also won Astrophotogallery.org's March 2013 Easy-Widefield category.